Background Active commuting is associated with various health benefits, but little is known about its causal relationship with body mass index (BMI). Methods We used cohort data from three consecutive annual waves of the British Household Panel Survey, a longitudinal study of nationally representative households, in 2004/2005 (n=15 791), 2005/2006 and 2006/2007. Participants selected for the analyses (n=4056) reported their usual main mode of travel to work at each time point. Self-reported height and weight were used to derive BMI at baseline and after 2 years. Multivariable linear regression analyses were used to assess associations between switching to and from active modes of travel (over 1 and 2 years) and change in BMI (over 2 years) and to assess dose–response relationships. Results After adjustment for socioeconomic and health-related covariates, the first analysis (n=3269) showed that switching from private motor transport to active travel or public transport (n=179) was associated with a significant reduction in BMI compared with continued private motor vehicle use (n=3090; −0.32 kg/m2, 95% CI −0.60 to −0.05). Larger adjusted effect sizes were associated with switching to active travel (n=109; −0.45 kg/m2, −0.78 to −0.11), particularly among those who switched within the first year and those with the longest journeys. The second analysis (n=787) showed that switching from active travel or public transport to private motor transport was associated with a significant increase in BMI (0.34 kg/m2, 0.05 to 0.64). Conclusions Interventions to enable commuters to switch from private motor transport to more active modes of travel could contribute to reducing population mean BMI. Public health guidelines encourage adults to undertake at least 30 min of moderate-intensity physical activity daily to help prevent obesity and several other chronic conditions.1 While opportunities to increase time spent being active at home or during leisure or work time can be costly or limited, incorporating walking or cycling into the journey to and from work may represent a relatively low cost, more feasible option for many people.2–4 Cross-sectional studies have identified individual-level associations between walking and cycling to work and various health outcomes including lower body mass index (BMI)5 ,6 and lower prevalence of cardiovascular disease or diabetes.5 ,7 Of 30 individual-level studies of the association between active travel and BMI identified in a recent review, 25 reported statistically significant negative relationships (p<0.05).8 However, just one study identified in the review,9 and one further study of the relationship between active travel and overall physical activity in adults,10 used longitudinal study designs. This limits the potential for drawing reliable causal inferences, not least because other studies have indicated that increases in body weight may precede reductions in physical activity.8 ,11 ,12 Other longitudinal ecological studies have demonstrated population-level correlations between decreasing active travel,13 increasing car use14–16 and increasing prevalence of adult obesity or average BMI over time. To the best of our knowledge, however, no longitudinal study has used a nationally representative data set to examine the individual-level impact on BMI of switching between modes of travel.17 This paper uses cohort data from the British Household Panel Survey (BHPS) to estimate the effects on BMI of switching between private motor transport and active travel or public transport (which typically involves some walking or cycling to or from stations or stops)18 ,19 for the journey to and from work. The BHPS is a longitudinal study of private households in Great Britain that began in 1991/1992 as an annual survey of each adult member of a nationally representative sample of households (BHPS waves after 2008/2009 are encompassed in the new ‘Understanding Society’ survey, http://www.iser.essex.ac.uk/survey/bhps).20 Self-reported height and weight were reported in only two waves: September 2004–May 2005 (subsequently referred to as t0, n=15 791) and September 2006–March 2007 (t2, n=15 392). Data from these two waves and an intermediate wave (t1, September 2005–May 2006) were used in these analyses. Participants consented to use their survey information, and the data for these analyses were anonymous, with access administered by the UK Data Archive (http://www.data-archive.ac.uk). Figure 1 shows how the sample used in the analyses (n=4056) was selected from the original BHPS sample at t0 (n=15 791). Participants eligible for inclusion in the analyses were those aged over 18 years who reported the socioeconomic and health status characteristics listed below (under ‘Covariates and other participant characteristics’) and who reported their usual main mode of travel to work, height and weight at t0 and t2. An assessment of attrition bias and missing values bias comparing participants in the original BHPS sample with those retained in the analytical sample is presented in the online supplementary appendix. Samples used in the analyses and description of sample selection criteria. (a) To assess missing variables bias (height and weight data), characteristics of individuals who reported travel mode other than ‘other’ at t0 but not height and weight at t0 are compared with individuals who remained in the sample (see online supplementary appendix). (b) To assess attrition bias, characteristics of individuals who reported height and weight at t0 but had dropped out of the sample before t2 are compared with individuals who remained in the sample (see online supplementary appendix). (c) Of whom 10 participants had a commute time of >30 min at t0, 42 switched between t0 and t1, and the most common travel mode switched to was walking (n=83). (d) Of whom 32 participants had a commute time of >30 min at t0, 26 switched between t0 and t1, and the most common travel mode switched to was rail travel (n=32). (e) Of whom 10 participants had a commute time of >30 min at t0, 84 switched between t0 and t1, and the most common travel mode switched from was walking (n=121). (f) Of whom 59 participants had a commute time of >30 min at t0, 56 switched between t0 and t1, and the most common travel mode switched from was bus/coach travel (n=73). The outcome variable used in the analyses was change in BMI between t0 and t2. BMI in each wave was calculated by dividing self-reported weight (reported in kg, or converted to kg from stones and pounds) by the square of self-reported height (reported in metres, or converted to metres from feet and inches). Where height differed between waves, baseline height was used to prevent small artefactual differences in height affecting the results (if, eg, height was reported using metric units in one wave and imperial units in the other). Follow-up height measures were used to replace implausible baseline values attributable to obvious data entry errors in three cases. A small number of participants were excluded from the analyses due to implausible values for weight (<30 kg, n=7) or change in weight (>87 kg, n=7). Following contact with BHPS administrators, other adjustments were also made for coding errors in imperial measurements (please contact authors for details). Participants reported their usual main mode of travel to work at t0, t1 and t2 in nine categories. For each wave, participants were categorised as using active modes of travel (‘walking’ or ‘cycling’), public transport (‘bus/coach’, or rail: ‘train’ or ‘underground/metro’), or private motor transport (‘car or van’, ‘car/van passenger’ or ‘motorcycle’). Participants who reported using ‘other’ modes of travel were excluded from analysis. Covariates were used to account for selected individual-level characteristics reported at t0, and changes in individual-level characteristics between t0 and t2, which have previously been shown to be associated with active travel and obesity,5 ,6 ,16 ,21–25 and hence were hypothesised to act as potential confounders of the relationship between active travel and BMI. The covariates reported at t0 were: age, gender, occupational status (for analytical purposes, binary variables were created for each of the seven Registrar General’s Social Class categories), working hours (2 binary variables: weekly hours of work ≥30 (‘full-time’) versus <30 (‘part-time’), and night-time versus other-time work), annual household income (quintiles to account for the impact of household size and age of children on living standards, using the McClements equivalence scale),20 educational level (degree or higher qualification vs less than degree), number of children under 16 in the household (one or more vs none), self-reported health status (5 categories from ‘excellent’ to ‘very poor’), and number of cars in the household (1 or more vs none). The covariates which accounted for changes that occurred between t0 and t2 were: home location (a single variable: ≥1 move between t0 and t2), household income (2 variables: increase and decrease of >2 quintiles), health status (2 variables: increase and decrease of ≥2 categories), car access (2 variables: gaining and losing household access to ≥1 car), pregnancy (2 variables: becoming and no longer being pregnant). Other variables reported at t0 were also selected for use in the descriptive statistics: commuting time (minutes), region (13 categories), annual frequency of primary care and hospital outpatient visits, smoking status, and frequency of leisure activities in three separate categories: playing sport, walking or swimming (hereafter leisure time physical activity or LTPA), gardening and eating out. The variables and subsamples selected for use in 18 separate analytical models (models A-R) are summarised in figure 2. To assess the effects of switching to and from active commuting, two separate analyses were conducted. First, we examined the effect of switching from private motor transport at t0 to active travel or public transport at t2 on change in BMI (analysis 1). Participants who switched (‘the exposed’) were compared with those who maintained use of the same mode of private motor transport at t0, t1 and t2 (‘the unexposed’). Those participants in the exposed group who had switched between t0 and t1 were also compared with those in the unexposed group in order to study temporal effects. Second, we examined the effect of switching from active travel or public transport at t0 to private motor transport at t1 or t2 on BMI (analysis 2). Participants who switched were compared with those who maintained use of the same mode of active travel or public transport at t0, t1 and t2. Participants who switched between different modes of private motor transport (analysis 1) or of active travel or public transport (analysis 2) were excluded from the respective unexposed groups. χ2, Mann-Whitney and Student t tests were used to compare the characteristics of the exposed and unexposed groups. Summary of the independent variables and sample restrictions used in the statistical models. Multivariable linear regression models were used to estimate the association between change in usual mode of transport (binary or multinomial independent variable) and change in BMI with progressive adjustment for (1) individual characteristics (age, gender and BMI at t0), (2) further characteristics at t0 (occupational status, working hours, household income, education, children, health status and car access) and (3) changes in home location, income, health, car access and pregnancy status. Additional analyses were used to explore dose–response relationships using subsamples of participants with different baseline commute times (in 3 separate categories >10, >20 and >30 min), a reasonable proxy for distance to work, since all participants in a given analysis used the same usual mode of travel at t0. Statistical analyses were conducted using STATA V.13.1. Table 1 shows basic descriptive statistics and comparisons of groups used in the analyses at t0 and t2. Of 3269 individuals included in this analysis, 179 were in the exposed group. Of these, 109 switched to active travel (most often walking, n=83) and 70 to public transport (most often rail, n=32). Switchers were significantly younger on average than non-switchers (eg, for active travel: 37.8 vs 41.2 years at t0, table 1) and less likely to have access to a car (eg, for active travel: 95.4% vs 98.8%). No statistically significant differences were observed between groups in terms of mean BMI, although those who switched to active travel were less likely to be classified as overweight or obese at baseline (52.3% vs 64.7%). Those who switched to active travel, but not those who switched to public transport, also had a significantly lower mean adjusted household income (£28 087 vs £32 495); a higher likelihood of smoking (31.2% vs 22.8%); a shorter mean commute time (16.5 vs 23.0 min at t0), which became shorter still after taking up active travel (13.9 min at t2); and a higher likelihood of weekly LTPA (68.8% vs 57.8% at t0) than non-switchers. Those who switched to public transport were significantly more likely to hold a degree or higher qualification (34.3% vs 19.4%). No statistically significant differences in household composition or health status were observed between groups. Switching from private motor transport to active travel or public transport was associated with a significant reduction in BMI of −0.32 kg/m2 (95% CI −0.60 to −0.05) after adjustment for all covariates (table 2, model C). Smaller, statistically insignificant effect sizes were estimated in the two models that did not control for time-varying potential confounding factors (eg, model B: −0.21 kg/m2, 95% CI −0.47 to 0.06). When the effects of switching to active travel and public transport were modelled separately, larger and statistically significant adjusted effect sizes were associated with switching to active travel between t0 and t2 (model D: −0.45 kg/m2, −0.78 to −0.11) and in the analysis restricted to participants who switched to active travel between t0 and t1 (model F: −0.59 kg/m2, −1.11 to −0.06). Effect sizes associated with switching from private motor transport to active travel also consistently became larger as participants with shorter baseline journeys were excluded from the analysis, rising to −0.75 kg/m2 among those switching to active travel with journey times >10 min to −2.25 kg/m2 for those >30 min (⇓table 2, models G–I). Significant differences in the characteristics of individuals, notably in terms of age, gender, income and baseline BMI were identified when comparing participants in the original BHPS sample with those retained in the analytical sample (see online supplementary appendix). Of 787 individuals included in this analysis, 268 were in the exposed group. Of these, 156 switched from active travel (most often walking, n=121) and 112 from public transport (most often bus or coach, n=73). Again, switchers were significantly younger on average than non-switchers (eg, for active travel: 35.1 vs 41.2 years at t0, table 1), but other differences in baseline working hours, income, education, children, health status, mean BMI and obesity status were not significant. Car access was more prevalent among those who switched from active travel at t0 and t2 and also among those who switched from public transport at t2. Those who switched from active travel were significantly less likely than either non-switchers or those who switched from public transport to hold a professional or managerial occupation (eg, 24.4% for switchers from active travel vs 34.5% for non-switchers) and more likely to undertake weekly LTPA (74.4% vs 64.7%), and had a shorter mean commute time (13.7 vs 27.4 min at t0) which increased after switching to private motor transport (18.0 min at t2). In contrast, those who switched from public transport had a longer mean commute time (42.4 min at t0) which was reduced after switching to private motor transport (29.5 min at t2). Switching from active travel or public transport to private motor transport was associated with a significant increase in BMI of 0.34 kg/m2 (0.05 to 0.64) after adjustment for all covariates (table 2, model L). When the effects of switching from active travel and public transport were modelled separately, a statistically significant adjusted effect size was associated with switching from public transport (model M: 0.46 kg/m2, 0.06–0.86). Statistically significant effects were not observed in the models restricted to participants who switched between t0 and t1. The significant negative association observed between change in BMI and switching from private motor transport to active travel or public transport (model C), and the significant positive association with switching from public transport to private motor transport (models J–M), supports the implications of existing studies showing that public transport users can undertake meaningful levels of physical activity when accessing stations or stops.5 ,18 ,19 ,37–39 The cross-sectional UK studies referred to above also identified an association between BMI and public transport use compared with private motor transport (eg, −0.24 kg/m2).5 ,6 Nevertheless, we did not observe significant associations in our analyses of switching from private motor transport which accounted for public transport separately from active travel (models D and F). This may reflect important differences between bus and rail travel—for example, that rail passengers walk further on average to access stops than bus passengers5 ,18 ,19 ,37–39—which could not be adequately explored in this study because of small sample sizes. Large differences were also identified in the socioeconomic characteristics of participants who switched to rail travel compared with those who switched to bus travel (eg, mean household income: £45 113 vs £25 959). While rail travel in Great Britain has grown at a much faster rate than road traffic or bus travel in recent years,40 future studies could explore the size and distribution of benefits associated with these changes and their implications for strategies to reduce health inequalities. This study has extended existing literature on the health benefits of active travel by providing longitudinal evidence from a national survey of a relationship between switching to and from more active modes of travel to work and modest changes in BMI. Previous cross-sectional studies have shown that commuters who used active travel or public transport had significantly lower body mass index (BMI) than their counterparts who used private motor transport. 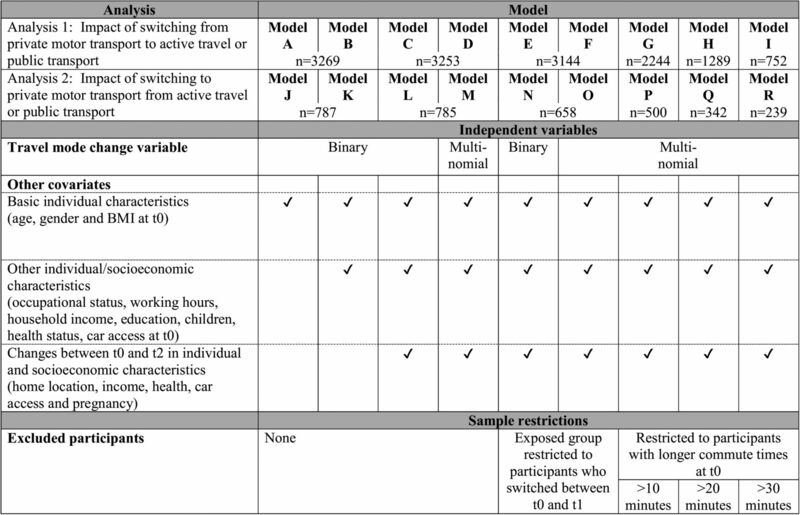 However, no longitudinal study has used cohort data from a nationally representative survey to explore the impact on individual-level BMI of switching between different modes of travel. This study used cohort data from the British Household Panel Survey and identified a statistically significant net reduction in body mass index over a 2-year period among commuters who switched from private motor transport to active travel or public transport. The results provide more robust support for causal inference than existing cross-sectional studies and strengthen the case for policymakers to promote population health by incentivising walking or cycling. Data from the BHPS were supplied by the UK Data Archive. World Health Organisation. Global recommendations on physical activity for health. Geneva, 2010. House of Commons Health Committee. Third report of session 2003–04: obesity. London: The Stationary Office Limited, 2004.
. Associations between active commuting, body fat, and body mass index: population based, cross sectional study in the United Kingdom. BMJ 2014;349:g4887.
. Walking, cycling, and obesity rates in Europe, North America, and Australia. J Phys Act Health 2008;5:795–814.
. Linking transport, health and sustainability: better data sets for better policy-making. J Transp Health 2014.
. British Household Panel Survey-User Manual—Volume A: introduction, technical report and appendices. Institute for Social and Economic Research, University of Essex, Colchester 2001.
. On the move: making sense of car and train travel trends in Britain. London: RAC Foundation, 2012. Contributors This study design was originated by AM, JP, MS and DO. AM undertook the literature review, conducted the data analysis and drafted the manuscript. JP, MS and DO contributed to interpreting the results and drafting of the manuscript. All authors approved the final version of the manuscript. Funding The work was undertaken by the Centre for Diet and Activity Research (CEDAR), a UKCRC Public Health Research Centre of Excellence. Funding from the British Heart Foundation, Cancer Research UK, Economic and Social Research Council, Medical Research Council (MRC), the National Institute for Health Research (NIHR), and the Wellcome Trust, under the auspices of the UK Clinical Research Collaboration, is gratefully acknowledged. JP is also funded by an NIHR Post-Doctoral Fellowship (PDF 2012-05-157), and David Ogilvie is supported by the MRC (Unit programme number MC_UU_12015/6). Ethics approval The British Household Panel Survey has adopted, in full, the ethical guidelines of the Social Research Association. Data sharing statement All data from the British Household Panel Survey are published and accessible to researchers through the UK Data Archive.